We rescue and release sick and injured birds of prey. Raptor Rehabilitation of Kentucky, Inc. was formed to: Rehabilitate injured raptors, raise orphaned birds of prey, and increase public awareness about the importance of raptors. Click need your help to keep our facility shipshape! Come help us on Saturday, April 13th at 10am to complete a variety of projects. We need to replace roofs, put in drainage, build a shed, and finish a few other odds and ends. Please dress for the weather and for dirty work! We do ask that volunteers all be 16 years of age (with parental consent) or older. If you have drills, saws, work gloves, shovels, wheelbarrows, or other tools, please feel free to bring them with you. Make sure that they are all labelled with your name. 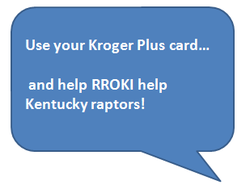 You'll start earning rewards for Raptor Rehab right away on qualifying purchases made using your Kroger Plus Card! Remember, you will need to re-enroll every August. Thanks for your support! Our work started in the 1980's with a group of dedicated volunteers. RROKI became incorporated as a nonprofit organization in 1990. We are an all volunteer group dedicated to the rehabilitation of sick, injured and orphaned birds of prey. We rely solely on the dedication of volunteers and the generosity of our supporters. We take in between 300-350 sick, injured and orphaned raptors every year, and release over 60% back into the wild. We count on the public to help get injured birds to us. The birds may have been hit by cars, flown into windows, or gotten caught in barbed wire fences. Although protected by state and federal laws, we still receive raptors who have been shot and poisoned. The saddest cases are those young birds who have been "saved" by people and are now imprinted - they think they are people. Those unfortunate imprints cannot be released back into the wild although there is nothing physically wrong with them. They have a mental problem and don't know how to act like birds. If you find an injured raptor, please call us at 502-491-1939 and leave a message if we can't get to the phone right away.